This article provides an overview of recent applications of computational modelling to the design of electric furnaces. The aim is to illustrate that computational modelling can more comprehensively represent the component physics, chemistry, and kinetics of the processes being evaluated. While the smelting process is understood in general terms, a fundamental and detailed understanding does not exist. Scientists and engineers have developed numerous mathematical models to analyse different aspects of the electric furnace smelting process, but the number of comprehensive computational models developed and published is limited. Computational modelling can provide a better understanding of the details of mass and energy transfer in the furnace bath. Energy efficiency can be improved, cooling systems can be optimised, and operability can be made more stable. One example of furnace bath modelling is shown in Fig. 1. The model represents one-third of the slag bath for a 3-electrode circular furnace. The objective for this work was to evaluate the effects of scale-up, with the scale-up encompassing both the intensity of the process and the size of the furnace. Fig. 1: Sample simulation showing the temperature and flow conditions in the slag bath of an electric furnace. The model represents one third of the bath. Specific issues that were addressed were the intensity and distribution of heat transfer to the sidewall, the stirring intensity in the bath, the ability to keep high melting point phases in suspension, and identifying optimal locations for feeding. A furnace bath is a tremendously challenging system to describe mathematically, and great care must be taken when doing so to ensure the usefulness of the model. The example shown in Fig. 1 included the effects of buoyancy, gas bubbles, and electromagnetics as driving forces, and Joule heating, melting, and reduction to account for the thermal energy supplied to and consumed in the bath. While the furnace model described here included many aspects of a multi-physics, multi-phase system, and was used to successfully design a new furnace, simplifications and assumptions were required, and some aspects of the component physics and chemistry could only be represented implicitly rather than explicitly, and were developed outside of the model. Continued development of mathematical algorithms and models to account for micro-scale phenomena occurring in the bath will make the modelling of this type of system more representative in the future, and therefore more valuable. The tapping of alloy or metal from an electric furnace is a critical operation, and the taphole is often considered to be the weakest point of the furnace in terms of safely containing the melt in the crucible. Fig. 2: Computational model showing the temperature distribution in a water cooled copper tapblock. The left side of the model shows the copper tapblock, and the right side shows the water piping that is cast into the tapblock. Refractory is not shown for clarity. Failure of the taphole can be serious, endangering the safety of employees and causing damage to the furnace. 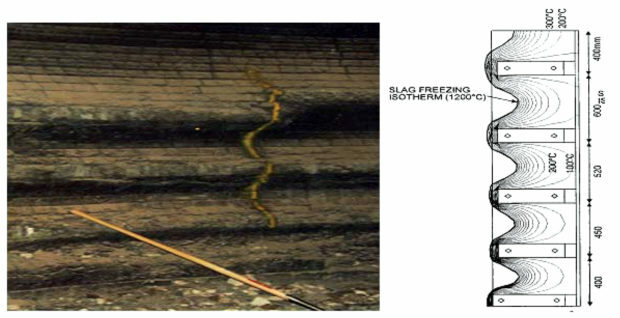 Operating time lost while repairs are made and the cost of these repairs, can have a significant impact on the financial performance of the smelter. Much work has been done to design robust and reliable tapholes, and simple refractory designs have been gradually replaced with water-cooled copper tapblocks, especially with increases in the operating intensity of furnaces. Computational modelling has played a significant role in the development of high performance water-cooled copper tapblocks, and continues to be an important analysis tool as tapblocks are designed to handle every increasing thermal loads. The furnace operator must also ensure that safe operating conditions are not exceeded and maintenance needs specific to the taphole are executed as required. For example, the operator will monitor block temperatures, and determine from these temperatures if the tapblock is operating within its design envelope and estimate the relative “health” of the block, i.e., whether there is a need for refractory repairs to be made, or even the replacement of the block. The generation of a model of a tapblock requires a high degree of dimensional accuracy, so in this case the computational model is created from the same CAD model that is used to design and manufacture the tapblock. Once generated, operating conditions for the tapblock are simulated as accurately as possible by including metal tapping, and the flow of water through the cooling water passage. Fig. 3: Comparison showing the thermal equilibrium erosion profile in a furnace (left) and that predicted by the computational model (right). The designer will optimise and refine the design of the tapblock so that the anticipated range of operating conditions will be achieved, including optimising the placement and density of cooling water passages to avoid localised boiling. The location of the thermocouples cast into the block will be specified for effective monitoring. The temperature signatures associated with different operating and wear conditions are used as fundamental input data for advanced monitoring and control systems. The advanced control system provides the operator with “intelligent” guidance for safe tapping and estimates the health of the tapblock. 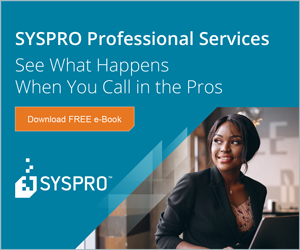 This eliminates the operator’s requirement to interpret temperature measurements, which can vary from operator to operator. An advanced control system is a must for the safe operation of a high intensity, high productivity furnace, and would not be possible without the comprehensive computational model that has been described here. There are a wide variety of cooling systems used on electric furnaces, ranging from simple air cooling for low rates of heat removal, to sophisticated water-cooled “waffle” type copper coolers for high rates of heat removal. Cooling of the hearth, upper and lower sidewalls, and furnace roof is common for a high-intensity, high-productivity furnace. With any cooling system, the objective is to remove a sufficient amount of the process heat to protect the furnace crucible from risk of run-out and increase its campaign life. The process heat load on the crucible has increased with the trend towards high power, high productivity furnaces, and water cooling has become a common practice because of its capacity for high heat removal and relatively low implementation and operating cost. The use of copper coolers has proven itself to be a safe and reliable method of using water [3, 6]. 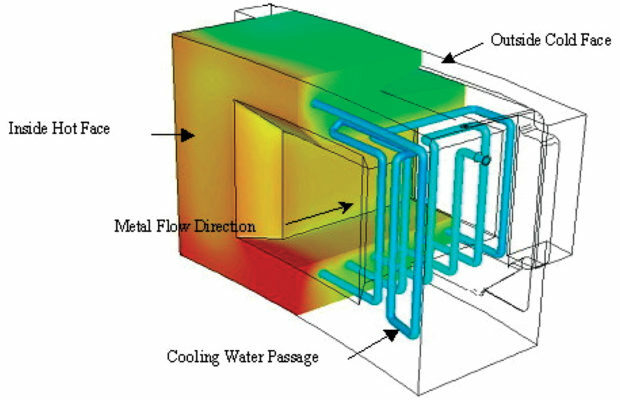 Computational modelling is used extensively in the design of furnace cooling systems, for both air-cooled and water-cooled systems. The purpose is to guide the designer in establishing the configuration and intensity of the cooling system required for a given process. The procedures and methods used for the modelling are well established, and process heat loads applied to the models are determined through measurement. Fig. 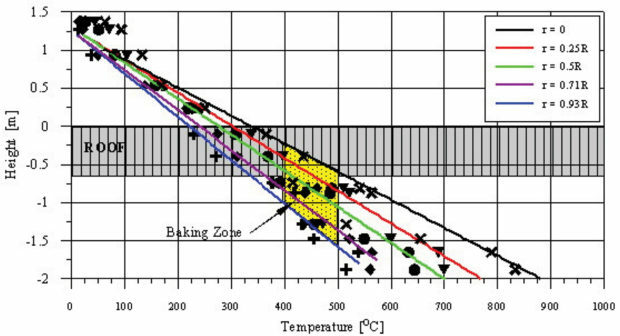 4: Predicted temperature distribution and baking zone location in a Soderberg electrode for three different operating conditions. Fig. 3 shows a comparison between the actual thermal equilibrium profile, defined as the slag freezing isotherm, measured in a furnace and that predicted by the computational model. Water-cooled copper plate coolers are installed in this instance. The close correlation between the measured and predicted results is evidence of the effectiveness of computational modelling for this type of work. This effectiveness has helped make water-cooled copper cooling systems the cooling technology of choice for high intensity furnaces. Efforts are currently directed at increasing the level of modelling detail in copper coolers so that the potential for localised boiling in the water passages can be investigated, and the effect of direct contact between the molten phase in the furnace and the copper cooler, as can occur when refractory spalls, can be evaluated. This requires full scale three dimensional models that include the flow of water through the passages, and include the transient melting and solidification of the bath and/or copper. 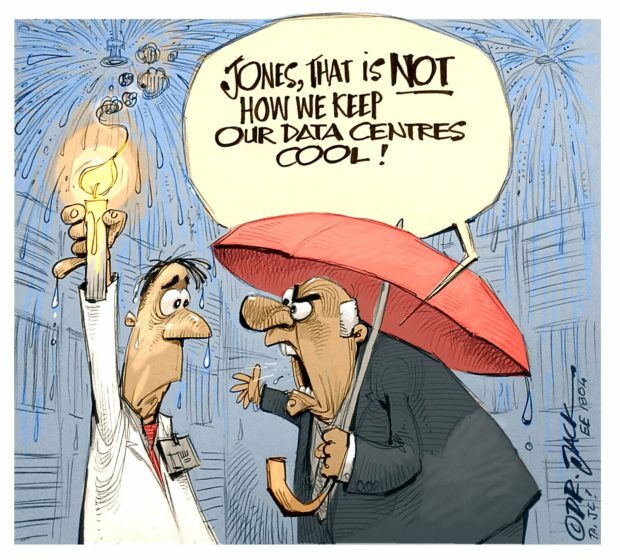 Similar efforts are also being directed at enhanced forced air cooling systems. Soderberg electrodes find extensive use in ferroalloy production, and electrode breaks must be avoided to maximise furnace availability. One of the keys to avoiding electrode breaks is to ensure that the electrode is baked properly and that the thermal stress does not exceed safe limits. 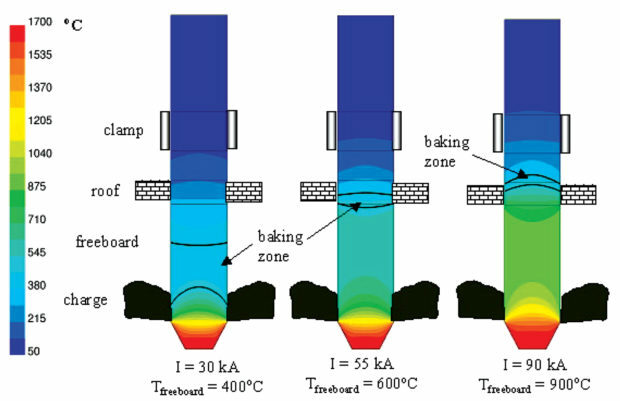 Computational modelling provides a means to evaluate both the baking behaviour of the electrode for different operating modes and the thermal stress in the electrode during transitional operating periods when stress in the electrodes is high. Fig. 5: Measured temperature distribution in a 1400 mm Soderberg electrode (R = 700 mm) for a nonferrous smelting furnace operating at an average current of 30 kA and a freeboard temperature of 600°C. Fig. 4 shows the location of the baking zone (400 to 500°C) for three different operating conditions in a non-ferrous smelting furnace. The electrode configuration for this furnace has the electrode clamps positioned above the roof, with the electrode extending down through the furnace freeboard and a thin layer of floating charge, before being immersed into the slag bath. Current levels and thermal conditions in the freeboard dictate the baking of the electrode, as is shown in this result. The computational model used to simulate the baking of electrodes is a coupled thermal-electromagnetic model that accounts for slipping of the electrode and the skin effect associated with AC current. All material properties are defined to include their temperature dependency. Confidence in the numerical model has been established through validation work which compares the results of the model with electrode temperature measurements made in operating furnaces. In addition to predicting the thermal condition of the electrode for normal furnace operation, transient conditions, such as during power-off, idling, and power-on periods, can also be modelled and the resulting thermal stress can be determined from the computed thermal gradients. Effective electrode management practices can be developed once this fundamental information is available and understood. This type of modelling has traditionally been completed as a stand-alone exercise, with engineers and operators taking the results, interpreting them, and then applying it to their operation as best they can. This transfer of knowledge and extrapolation can be eliminated by running the models in real time, with model inputs coming directly from furnace operating conditions. This is feasible because of the continued development of numerical algorithms and the availability of low cost computing power. With an electrode model running in real time, good electrode management will be easier to accomplish. Fig. 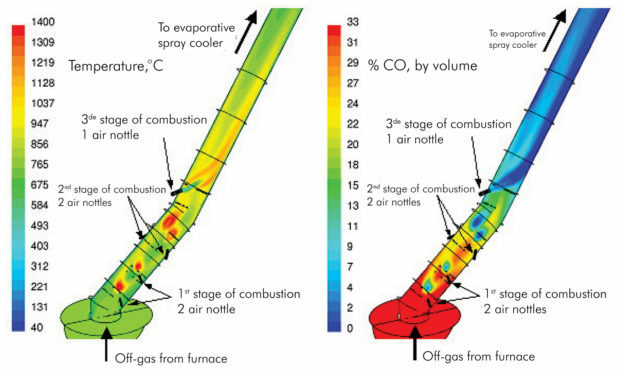 6: Simulation results showing the temperature profile (left) and CO gas concentration (right) in a water cooled combustion chamber. The off-gas system is a critical component of an electric furnace and represents approximately 50% of the total installed smelter cost, depending on the requirements of the operation. Poor performance of the off-gas system will have a negative impact on the productivity of the furnace, prevent environmental emission targets from being achieved, increase maintenance and operating costs, and compromise the safety of employees. The design of an off-gas system that provides the performance and reliability required for a modern electric smelting furnace is a complex task, and computational modelling plays an important role in the success of the design [9, 15]. One example of computational modelling for a component of an off-gas system is shown in Fig. 6. CO-rich gas leaving the furnace is burned in a water-cooled chamber before being cooled in an evaporative spray cooler and cleaned in a baghouse. 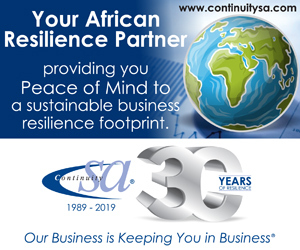 The destruction of CO gas is required to prevent explosions, and with the combustion chamber also acting as a duct to transport the gas to the spray cooler, the cost and footprint for the system is minimised. Air is introduced in a staged arrangement along the length of the combustion chamber in order to minimise peak gas temperatures and ensure complete combustion of the CO gas. Computational modelling is well suited to the analysis and design optimisation of the equipment. Three-dimensional transport of the combustion gases is solved along with the chemical reactions, with the heat transfer to the walls predicted. Fig. 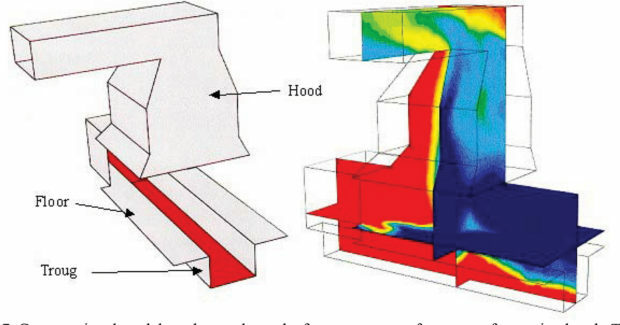 7: Computational model used to evaluate the fume capture performance of a tapping hood. The figure on the left shows the domain and components of the model, and the figure on the right shows the hood in operation. Once the model is developed, the effect on the combustion chamber performance of different design and operating conditions is evaluated, allowing the designer to customise the system to meet operating criteria. Operational data of gas temperature and CO concentration has validated the accuracy of the design for this equipment. Controlling emissions and providing a safe, clean, and comfortable work environment is a requirement of the modern smelter. 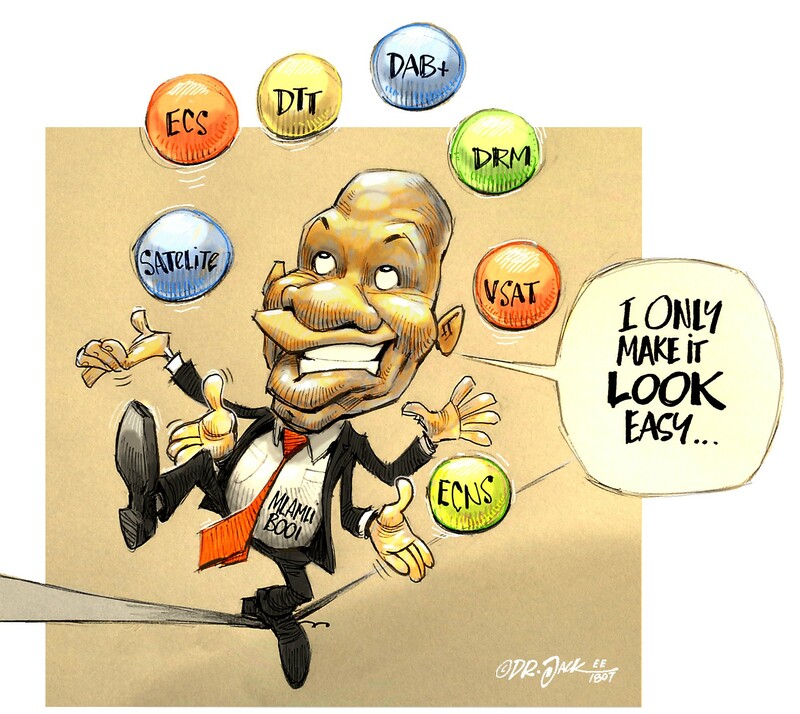 Successful operators recognise that a large part of their success is in the hands of employees. 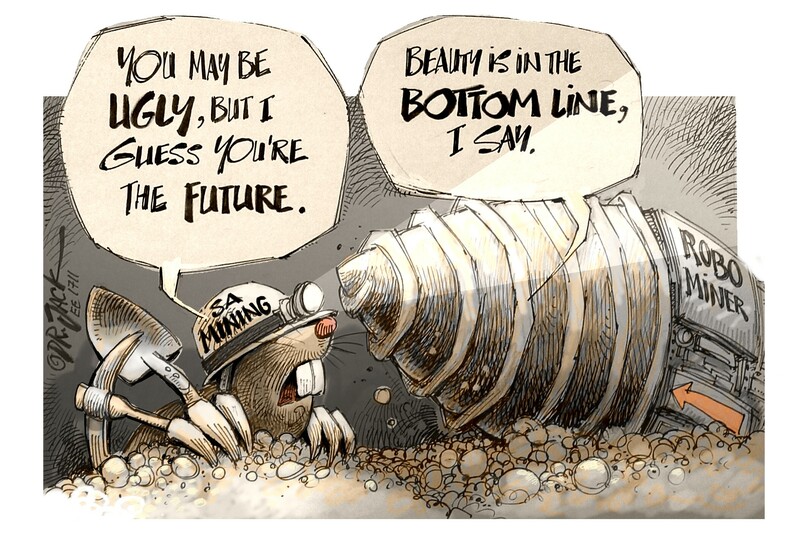 Employees distracted by poor or dangerous working conditions will not be inclined to maximise smelter productivity regardless of how well the equipment operates. Therefore, effective control of fugitive emissions and a good building ventilation system are required for a high productivity, high efficiency smelter operation. Computational modelling is routinely used by designers to develop low cost, effective systems for fume control and building ventilation. Quantification of capture performance of collection hoods, evaluating the local concentration of toxic gases such as CO within a smelter building, and calculating the heat stress workers will experience are all possible with the computation models available today. Fig. 8: Simulation result showing the effect of fume released into a smelter building and fume that is not captured by the canopy hoods installed for this purpose. The electric furnace continues to be a viable processing unit for the production of alloys and metals because of the innovations that have been made in its design and operation. The acceptance of computational modelling as an engineering tool in the minerals and metals processing industry has not come quickly. Rule-of-thumb designing and ad-hoc plant experimentation are still routinely practised. However, the inherent capability of computational modelling to simulate many aspects of real systems makes it a valuable engineering and analysis tool, a tool to be used in complement with traditional methods, such as, scale modelling, piloting, and carefully planned and controlled plant experimentation. Although much work has been done in the area of algorithm development and physical model development, there is still work yet to be done, especially for multi-phase, multi-physics problems. Therefore, it is important to recognise the need for rigorous validation of the computational model, as well as the application of experience and a sound process understanding. Subject to these conditions, future innovations in electric furnace design will be realised. DD Slatter: “Technological Trends in Chromium Unit Production and Supply”, 1995. M Ford and JF Oosthuizen: “The Production of Ferrochromium in a 40 MVA DC Plasma Furnace”, 1995. N Voermann, F Ham, J Merry, R Veenstra and K Hutchinson: “Furnace Cooling Design for Modern High-Intensity Pyrometallurgical Processes”, 1999. RC Francki, KM Donaldson, FE Ham and JG Schofield: “Design of Refractories and Bindings for Modern High-Productivity Pyrometallurgical Furnaces”, 1993. R Veenstra, N Voermann and B Wasmund: “Prototype Metal Tap Block Design, Vessel Integrity in non-ferrous Smelting and Converting”, 1997. AG Matyas, RC Francki, KM Donaldson and B Wasmund: “Application of New Technology in the Design of High-Power Electric Smelting Furnaces”, 1992. G Dosa, A Kepes, T Ma and P Fantin: “Computer Control of High Power Electric Furnaces”, 1996. ST Johansen, S Graadahl, JA Byberg, H Tveit and AA Walderhaug: “Environmental Aspects of Ferro-silicon Furnace Operations – An Investigation of Waste Gas Dynamics”, 1998.
 RJ Haywood, M Russell, and B Wiggins: “Modern Design Practice in Post-Combustion Off-gas Systems for Metallurgical Furnaces”, 2002. GA Saevarsdottir, JA Bakken, VG Sevastyanenko and L Gu: “Modelling of AC Arcs in Submerged-Arc Furnaces for Production of Silicon and Ferrosilicon”, 2001. GJ Bendzsak and WD Baines: “Analysis of Heat and Mass Transfer Mechanisms in Electric Smelting Furnaces”, 1992. J Szekely, J McKelliget and M Choudhary: “Heat-transfer Fluid Flow and Bath Circulation in Electric Furnaces and DC Plasma Furnaces”, 1983. LH Gunnewiek and S Tullis, “Prediction of Heat and Fluid Flow in the Slag Phase of an Electric Arc Reduction Furnace”, 1996. MP Schwarz: “Computational Modelling of Metals Reduction Processes”, 2001. LH Gunnewiek, L Oshinowo and T Plikas: “Establishing Confidence in Off-gas System Design Using Computational Fluid Dynamic Modelling”, 2001. RA Berryman and FE Ham: “Challenges in Electric Furnace Smelting of Nickel”, 2000.